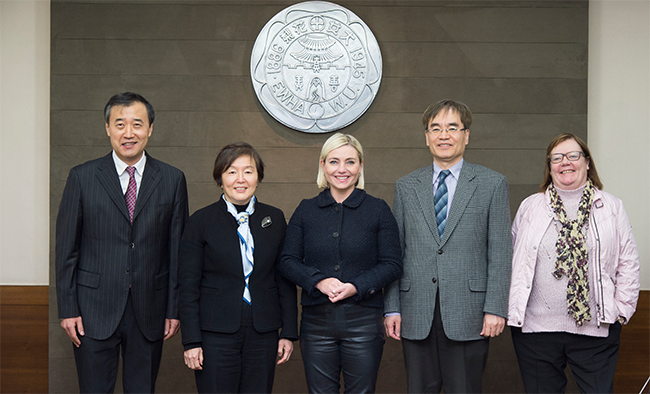 Lilja Dögg Alfreðsdóttir, the Icelandic Minister of Education, Science and Culture visited Ewha Womans University on Tuesday, February 6, 2018. Recalling her first visit to Ewha as a visiting student in 1994, she came again to the same university in 24 years. In 1994, Lilja studied at the university as a visiting student by participating in a program called Asian Studies at Ewha. This time, however, the minister came to Korea as a representative of the Icelandic government for the 2018 PyeongChang Winter Olympics and the first place on her itinerary was Ewha Womans University. Taking office as the Icelandic Minister of Education, Science and Culture in 2016, Lilja has been working on the overall management of policies on education, science and culture of the country in her early 40s. She has established a strong presence as a woman leader in the Icelandic society. Lilja and her staff were first taken on a tour of Ewha Archives, taking an opportunity to trace the history of Ewha and feel its spirit, and then met with President Kim Hei-sook at a reception room in Pfeiffer Hall (Main Hall). The Icelandic minister expressed her feeling about revisit to Ewha in 24 years and had a discussion with Kim about various topics such as education and woman leadership of Ewha Womans University. Lilja Alfreðsdóttir’s visit to Ewha this time is meaningful because she is a great example showing that an outstanding international student who once studied at Ewha has grown up to a brilliant female leader back in her country based on the experience of the international study. As recently as 24 years ago when she studied at the university, Ewha had partnership with 26 institutions (schools) in 10 countries, but now the university interacts with 984 foreign institutions in 81 countries and runs a variety of international programs to strengthen its global competitiveness.